Or view larger version. Untitled (California mining scene). 1858. Unknown photographer. Albumen print. Collection of Oakland Museum of California. Gift of Dr. and Mrs. Dudley P. Bell. 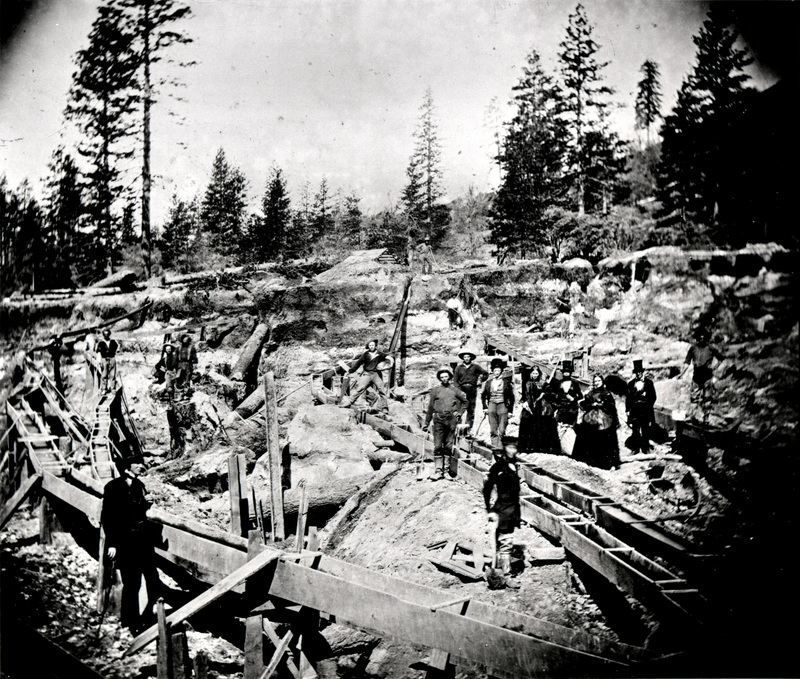 This is a photograph of gold miners during the California Gold Rush standing next to a series of connected sluice boxes. Sluice boxes were used in the process of placer mining. A sluice box is a sturdy rectangular box, built of wood, with an open top, and an open bottom roughened by a set of riffle bars. Water and placer dirt are put into the sluice box at the front end of the sluice box and as the water and dirt flow down the sluice box, with small pieces of heavy gold are caught behind the riffle bars.